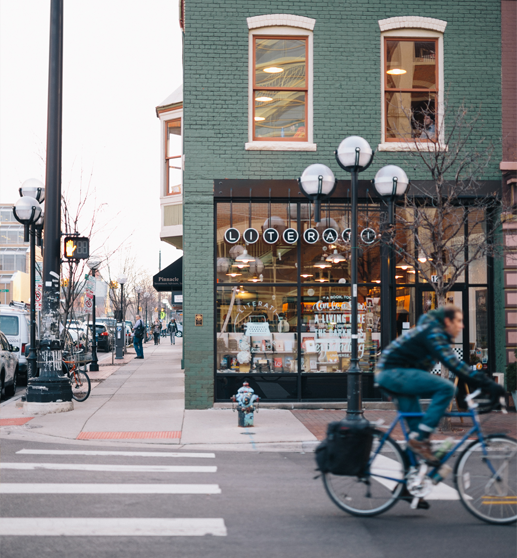 We are located in the heart of downtown Ann Arbor, Michigan, just a few blocks away from the University of Michigan's campus. Literati is also online! We can ship books and our subscription program anywhere in the United States. Please note that while we have three floors, we do not have an elevator. There is an accessible main floor entrance at our 4th avenue entrance. There is a parking structure directly across the street from Literati Bookstore at Washington and 4th in downtown Ann Arbor, Michigan. Parking is $1.20/hour and free on Sundays. This lot does fill up quickly on Friday and Saturday evenings. There is another larger lot at 4th and William, two blocks south on 4th Ave. There is also street metered parking on both Washington and 4th. Unfortunately, we do not validate. There are also a few bike racks along our 4th avenue side, as well as across the street in the parking garage. If you cannot find parking and are picking up a book you've already paid for, just call us, and one of us can try to bring the book curbside to you.